The Central Focus Retreat for Grace Brethren ministry leaders concluded Wednesday morning as the group gathered to review and reflect on how their values should influence how one reacts in real-life situations and to discuss how to tackle issues related to the common Grace Brethren identity. 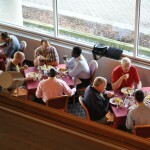 It was the conclusion to two and one-half days of introspection and conversation as pastors from around the Midwest gathered at the Maumee Bay Lodge and Conference Center near Toledo, Ohio. 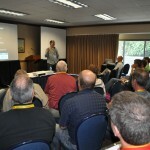 Sessions were led by Dave Guiles, executive director for Encompass World Partners. 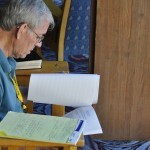 During the retreat, participants were provided opportunities to learn the stories from other generations and there was time to reflect on their own personal ministry values. 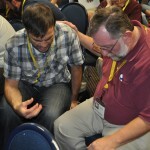 Each participant was encouraged to write a letter to their “Timothy,” or a ministry protege. In the letter, they were to pass along values that they want others to see in themselves and that they would like to pass on to the next generation. Click here to read the Timothy Letters. 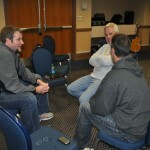 A few photos from the retreat are included with this post. Additional photos may be found at facebook.com/graceconnectus. 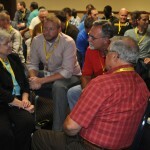 The Central Focus Retreat is the first of a series of regional retreats for Grace Brethren leaders. The same program will be repeated at each one. 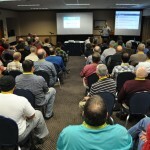 The next one will be held October 21-23 at Ocean City, Md. Grace Brethren ministry leaders are encouraged to pick one of the retreats (in your region or otherwise) to attend, as the input from the sessions will be important in next year’s Identity Project. 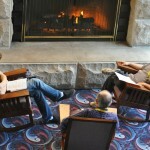 Future retreats are planned in Southern California, Florida, and Washington State. 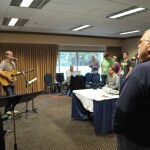 Jason Bradshaw, pastor of music and counseling at the Grace Brethren Church in Greenville, Ohio (Danny Wright, pastor), led worship. Dave Guiles, executive director at Encompass World Partners, led the sessions. 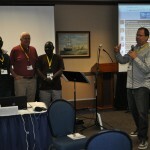 African pastors, Simon-Pierre Nadjilao, of the Central African Republic, and Yerima Betelmbaye, from Chad, were present. Larry DeArmey, center, translated for them.